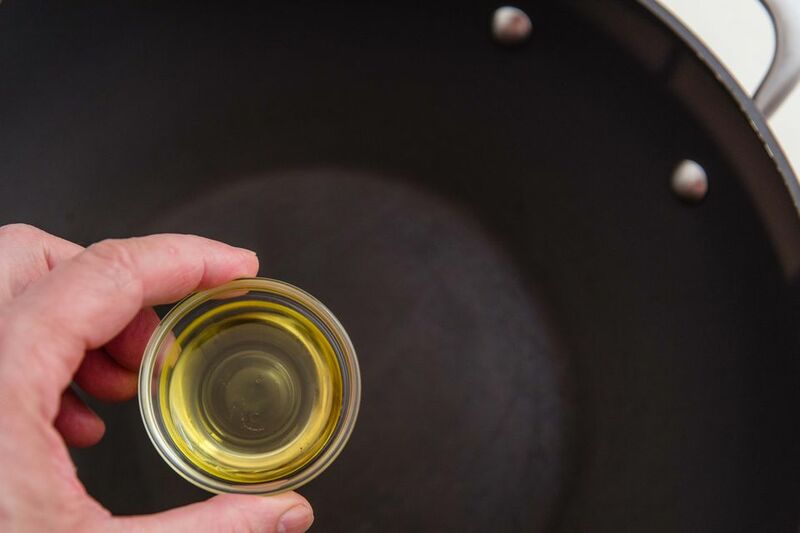 When adding oil for a stir-fry, you want the oil to partially coat about halfway up the sides of the wok as well as the bottom. This is because the food is often pushed up to the sides of the wok during stir-frying. For example, in a chicken and vegetable stir-fry, the vegetables may be stir-fried briefly, then pushed to the sides of the wok, and the chicken meat added in the middle. The vegetables finish cooking (but not burning) at a lower heat on the sides, while you are stir-frying the chicken meat in the middle, hottest portion of the wok. An added benefit to spreading the oil over the sides and bottom of the wok is that it heats faster. Method 2: Add the oil to a preheated wok, then use the back of a spatula to coat the sides of the wok with the oil, going about halfway up.